The Paine is a historic estate that serves as a multi-faceted museum for learning and inspiration. The museum preserves the property’s historic architecture, with the mansion as the centerpiece, and many of the house’s interiors as they were created by founders Nathan and Jessie Kimberly Paine. Selections from the museum’s art collection, much of which was acquired by Nathan and Jessie, are featured in the many rooms and settings of the estate. 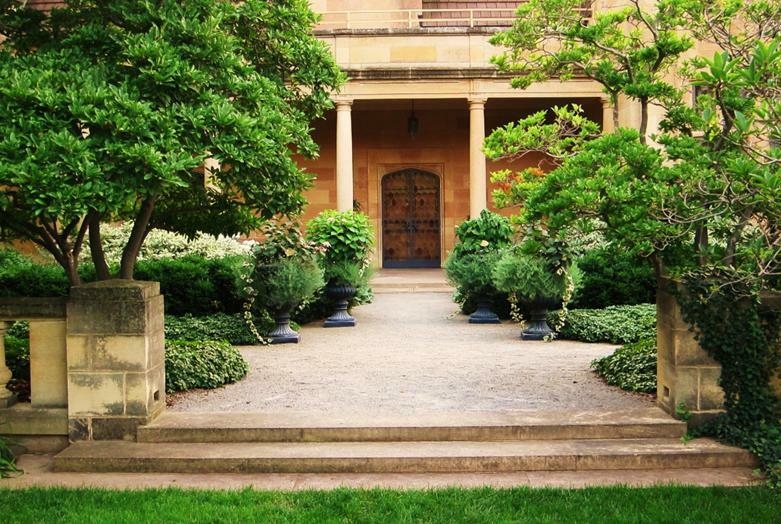 Outdoors, the Paine maintains and enhances numerous display gardens as “galleries” of horticulture with varied designs and thousands of plant specimens. In addition, the museum presents changing art exhibitions, from classical to contemporary, as well as seasonal events like Nutcracker in the Castle during the holidays. The Studio, located on the house’s lower level, offers a relaxing space for learning and creating, and the Paine hosts a wide range of programs throughout the year in the carriage house and conservatory. Nathan Paine grew up with the family milling business, and by the mid-1920s was president of the thriving Paine Lumber Company, which covered sixty acres along the Fox River in Oshkosh and employed over two thousand workers. Jessie Kimberly was the daughter of the co-founder of Kimberly-Clark, an ever expanding paper mill and products business in neighboring Neenah.Since their wedding in 1896, Nathan and Jessie lived in a Victorian house in Oshkosh built by Nathan’s grandfather. 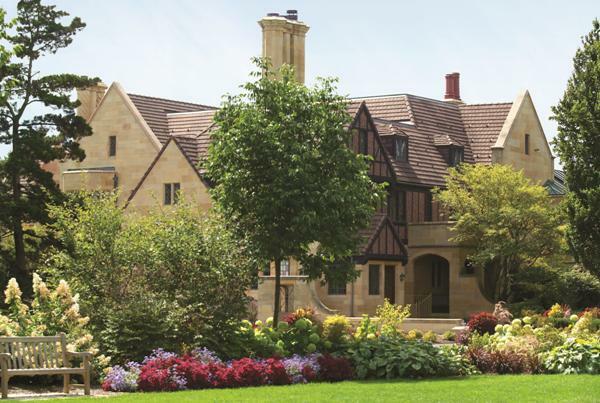 In 1925, upon the recommendation of Jessie’s sister, Mary Kimberly Shirk, the Paines commissioned Bryant Fleming, an architect from Ithaca, New York, to design a Tudor Revival-style country estate. Both Nathan and Jessie’s ancestors were English, which likely inspired their selection of this architectural style and much of the interior design and furnishings. 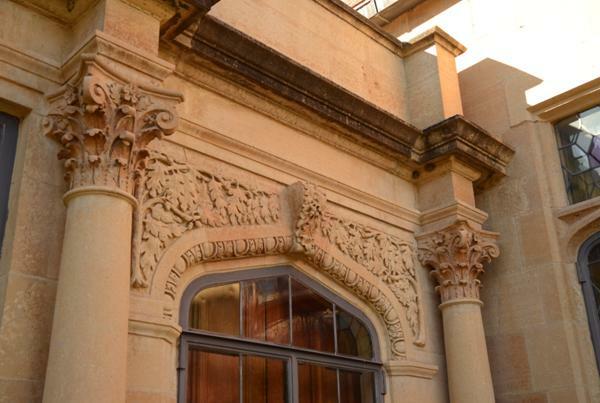 From the beginning, the Paines’ ultimate goal was to design an estate showcasing exceptional architecture, furnishings, art, and natural beauty that would be open to the public for educational and cultural purposes. The Paine’s initially purchased a site outside of Oshkosh on the south shore of Lake Butte des Morts for their “country estate”. However, they realized that it would be difficult for the public to visit there and eventually decided upon the property on Algoma Boulevard. 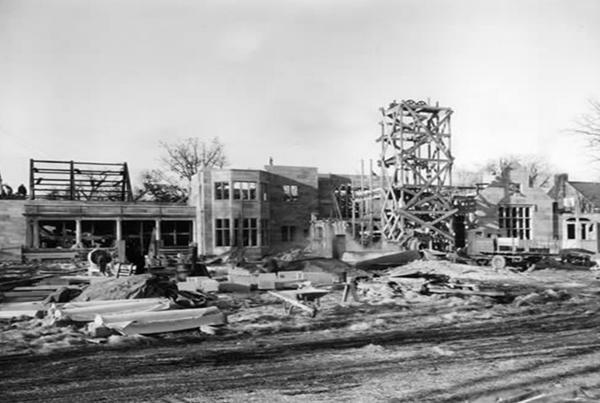 Construction began in 1927, and the exterior structure was completed by 1930. As the Great Depression crippled the Paine Lumber Company, all remaining work on the house came to a halt by 1932. The property received only minimal care and attention until 1946 when Nathan and Jessie finalized legal plans to establish the estate as a museum. 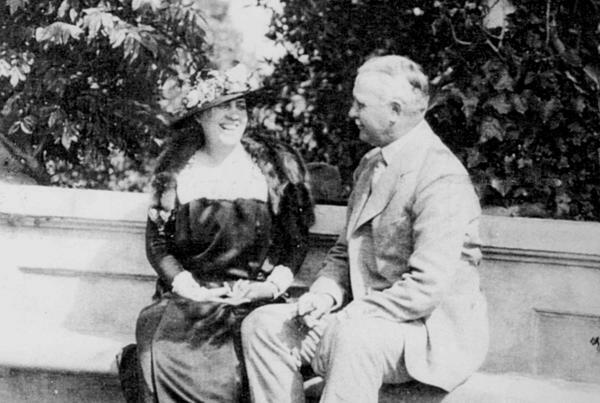 Nathan died in 1947 at the age of 77, and following his wishes, Jessie oversaw the remaining work which readied the house for opening to the public in 1948. Neither Nathan nor Jessie ever lived in the house, and they had no children. Until Jessie’s death in 1973 at the age of 100, she served as the museum’s president while residing in La Jolla, California, near her sister Mary. 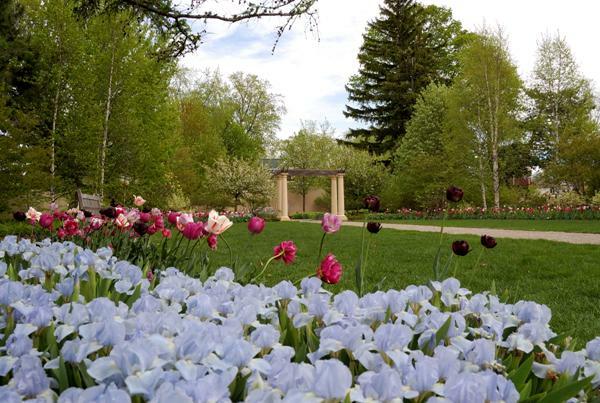 The Paine Art Center and Gardens is private, non-profit organization (501c3 tax-exempt) that is governed by a Board of Trustees and operated by a professional staff with the assistance of volunteers. The institution is accredited by the American Alliance of Museums, and the property is listed on the National Register of Historic Places. An endowment provides approximately a quarter of the organization’s annual funding, and the remaining three-quarters is raised through donations and fees, including admissions, memberships, grants, and rentals. The Paine relies upon the breadth of generous individuals and organizations to support the ongoing care and programs of the museum. Hospitality: We want every person to feel welcomed and graciously treated as a special guest throughout their visit with us. 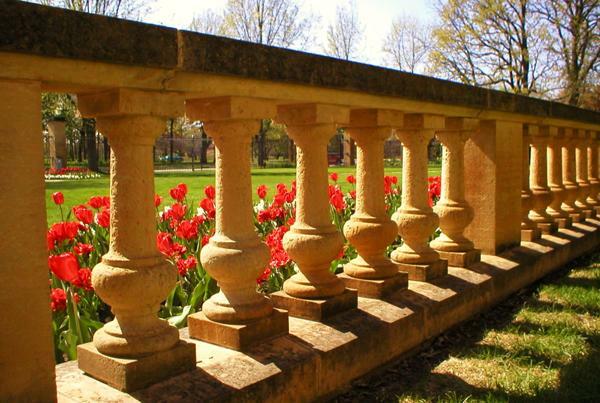 Beauty: We preserve and nurture an environment of exceptionally beautiful architecture, art, and gardens for the enrichment of the public. Excellence: We strive for the highest level of quality in all our interactions with the public and everything that we offer for their benefit. Respect: We value each person’s dignity, abilities, differences, and contributions. Teamwork: We work together with a positive attitude to ensure that all of our endeavors succeed. To inspire people to enjoy, create, and share beauty in their daily lives. The Paine would like to thank the many photographers whose images are featured throughout our website. When possible, the photographers are recognized where the photograph appears. Photos for the homepage banner were provided by: Eric Reischl, mansion view with reflection and garden view with tulips; and Hillary Quella Photography, interior view of the conservatory. Photos for the homepage features were provided by: Limelight Studios, image of family in Family Discovery Gallery; Eric Reischl, views of mansion and gardens; and Ken Cravillion Photography, image of wedding couple in Great Hall bay window.